MEGAPHONE is a community of activists working on issues such as the environment, women's rights, LGBTQ right, transparency and accountability and civic engagement. Together we try to understand the consequences of the shrinking civic space - a process that's been spreading around Central Eastern Europe as of late. During our meet-up in Romania in 2018 we were trying to understand how disinformation and propaganda are created and spread but also how to better tell our stories, engage more people in pro democratic actions and leave our information bubbles. MEGAPHONE podcast aims to show you new trends, threats and solutions which activists and civic activists all around the world are faced with. We look for things which were not discussed before bringing you knowledge and inspiration for your work. --- Tudor Brădățan is the Executive Director of Declic, a Romanian association of online campaigning, fighting injustice, destruction of the environment, inequality and human rights abuse. He studied Sociology and European Affairs, but earned his experience as a campaigner fighting large scale mining projects in Romania, especially the Rosia Montana project. The campaign to stop it, initiated in 2002, evolved into Romania’s biggest social and environmental movement. Tudor was throughout the years part of the strategy and communication team, working together with a very determined group of people to craft the messages and activities that successfully prevented Europe’s largest gold mine from happening . --- This podcast was created thanks to the support of Open Society Foundations and Charles Mott Foundation. MEGAPHONE podcast aims to show you new trends, threats and solutions which activists and civic activists all around the world are faced with. We look for things which were not discussed before bringing you knowledge and inspiration for your work. -- Klára Kalibová, PhD is the director of the In IUSTITIA NGO, a lawyer, analyst, and author; her main focus and expertise is on hate crime, hate speech and victims´ rights. She has undertaken research about hate crime in the Czech Republic (Lifecycle of Hate Crimes, 2017; Hate Crime Study for the EU Fundamental Rights Agency 2013; Sexual Violence in Czech Judicial Practice 2013; Forgotten Victims, 2010;). She regularly represents hate crime victims before the courts and is considered one of the most experienced Czech lawyers in the field. Recently she has focused on victims’ rights. She was a member of the preparation group drafting the Victims’ Rights Act within the Czech Ministry of Justice. Recently she contributed to the OSCE/ODIHR guidelines on assistance for hate crime victims. She is a member of the Czech Society for Criminology and the Radicalisation Awareness Network (Working Group on Voices of Victims of Terrorism). She is a co-founder and chair of the Czech Association of Providers of Services to Victims, an umbrella organization dedicated to advocacy on behalf of victims’ rights. In 2014, she was the recipient of the Alice G. Masaryk Human Rights Award for her commitment to the protection of victims of bias crimes. From 2009-2010, she was a Fulbright-Masaryk grantee and spent six months in the USA at the University of Michigan, the Anti-Defamation League and the Anti-Violence Project in New York, focusing on hate crime research. -- This podcast was created thanks to the support of Open Society Foundations and Charles Mott Foundation. MEGAPHONE podcast aims to show you new trends, threats and solutions which activists and civic activists all around the world are faced with. We look for things which were not discussed before bringing you knowledge and inspiration for your work. -- Avnik Melikian Avnik is a feminist activist who has built her career in a variety of roles while devoting her efforts to the democratization of Armenia. Avnik is the co-founder and president of Political Dialogue initiative (https://www.facebook.com/PoliticalDialogueNGO/) which focuses on building cooperation and dialogue between political parties and the civil society. Earlier in her career, she was the Vice-President on Strategy Development of the “European Youth Parliament” organization in Armenia. As an independent researcher and trainer engaged in community development projects, Avnik is passionate about civic activism, civic participation and non-formal learning -- This podcast was created thanks to the support of Open Society Foundations and Charles Mott Foundation. 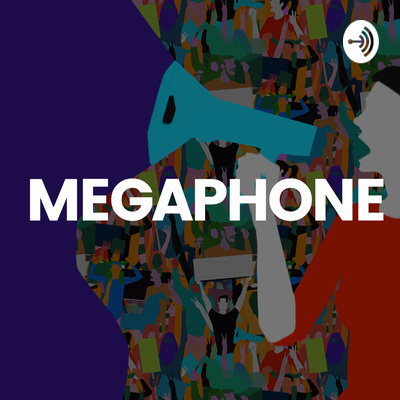 MEGAPHONE podcast aims to show you new trends, threats and solutions which activists and civic activists all around the world are faced with . We look for things which were not discussed before bringing you knowledge and inspiration for your work. -- Susan Comfort Hooked on social change since discovering how messed up our planet is, Susan Comfort has logged nearly 30 years in American nonprofits, raising millions, organizing political campaigns, serving on boards, and developing leaders. While environmentalism is her main passion, she also advocates for reproductive health and criminal justice reform, and lately, child’s play. Now she practices culture-building and organizational development with folks from nonprofit, government, and corporate sectors. She is directing a pilot project in DC (www.NonprofitWellness.org) to learn more about how physical and mental well-being affect performance and teamwork. -- This podcast was created thanks to the support of Open Society Foundations and Charles Mott Foundation. MEGAPHONE podcast aims to show you new trends, threats and solutions which activists and civic activists all around the world are faced with . We look for things which were not discussed before bringing you knowledge and inspiration for your work. -- Kateryna Kruk is a communications specialist and political scientist focusing on Ukrainian post-Maidan transition, international affairs and analyzing Russian disinformation campaigns in Ukraine. She is an external fellow at European Values Kremlin Watch program and an analyst at Stop Fake. Kateryna Kruk is also an author and a host of the TV program Stop Fake News which is devoted to issues of media literacy and exposing propaganda efforts. Kruk took an active part in the Euromaidan protests in 2013-2014, also known as a Revolution of Dignity. For her active role in communicating the revolution to the international audience, Kruk was awarded the Atlantic Council’s Freedom Award in 2014. As a communications expert, she worked in Ukrainian government (2014, 2017) and Ukrainian parliament (2016). -- This podcast was created thanks to the support of Open Society Foundations and Charles Mott Foundation. MEGAPHONE podcast aims to show you new trends, threats and solutions which activists and civic activists all around the world are faced with . We look for things which were not discussed before bringing you knowledge and inspiration for your work. -- Borna Sor is a writer and hosts of the satirical television show Prime Time on the regional news channel N1. He also writes columns and hosts an English language podcast for Total Croatian News. His work has appeared on Al Jazeera, Balkan Insight, and Gloria. Previously he was a writer and star for tv shows NewsBar on RTL, as well as Montirani Proces on HRT. He is the author and editor of hundreds of satirical articles for the website NewsBar. -- This podcast was created thanks to the support of Open Society Foundations and Charles Mott Foundation. Welcome to the MEGAPHONE Podcast!